NPL Youth United: Cup & League Double Winners! Hot on the heels of winning the Surrey Youth Premier League division title, NPL Youth United (our U17 team) today won the League Cup as well! On a baking hot day at Imber Court, NPL beat Premier Elite Champions Abbey Rangers 2-1 to lift their second trophy of the season. We were 1-0 down at half-time, but Ryan David equalised, before Alfie Pope snatched a stoppage time winner, to cue wild celebrations from a packed crowd of NPL faithful. Many congratulations to Steven Bates and his team for a fine season. This entry was posted in News, sticky on May 9, 2016 by admin. NPL U17s in line for double! This entry was posted in News, sticky on April 29, 2016 by admin. 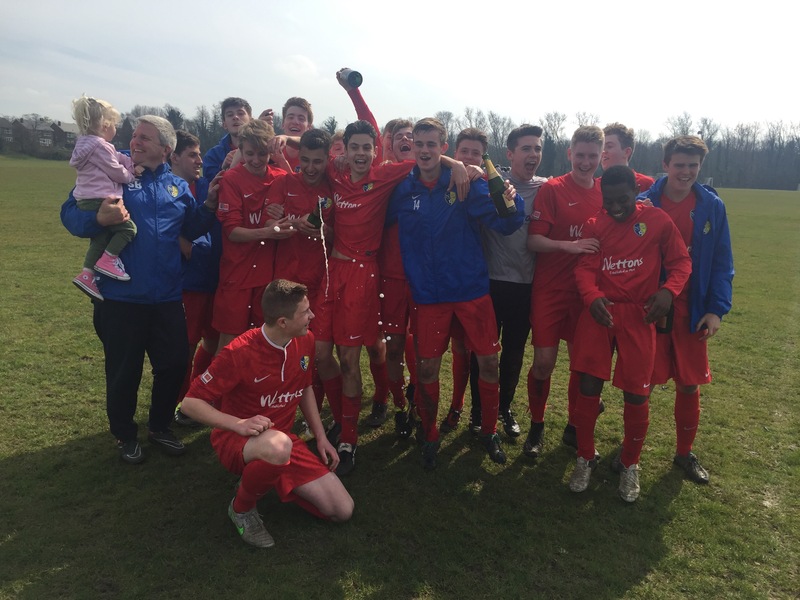 NPL Youth United – Premier League Champions! This entry was posted in News, sticky on April 4, 2016 by admin. Calling all Managers, parents and sponsors! You are invited to enter a team for our annual charity event. Procedes go to local charity Shooting Star Chase. Rules and entry form are linked: NPLYFC Walking Football Tournament 2016 Rules NPLYFC Walking Football Tournament 2016 Entry Form. This entry was posted in News, sticky on March 30, 2016 by admin. Our goalkeeper trainer Martin will not be training at Whitton tonight. Final training is 14th April. NPL Youth United's U18 team have made it through to the League Cup Final. Already 10 points clear at the top of the Premier League, we beat Premier Elite side Binfield in the Cup semi final. Scores were level at 1-1 after 90mins, but our boys stepped up a gear to win 4-1 after extra time. We will play Abbey Rangers in the final on Sunday 8th May, with a 14:30 KO at Met Police, Imber Court. This entry was posted in News, sticky on March 6, 2016 by admin. QPR will be running their half term soccer school during the half term week 15th – 19th February. This entry was posted in News, sticky on February 14, 2016 by admin. The U18s made it to their fourth cup final in four consecutive seasons with a brilliant 3-1 win at Hendon FC. It was a performance of skill, determination and just a little luck. Well done boys! Save the date NPL and come and cheer us on – Thursday 28th April. This entry was posted in News, sticky on January 17, 2016 by admin. Wednesday the 2nd December saw the NPL U8 teams attend an evening at the training centre of our partner club QPR, to play against their Academy side. The boys were excited to play at the Academy and the the 3G pitch and dome are amazing facilities. We set out to enjoy the night, make the most of the opportunity and learn from a skilled team. The friendly matches were evenly contested and the boys took their moment in the spotlight well. In a round robin friendly format NPL held their own, scoring as many goals as they conceded. They were not overwhelmed by some great talent and hopefully represented the Club well in both skills and attitude. A great evening was had by all and the parents should be proud of how the boys played. We look forward to more sessions like this, it was definitely one for the boys to remember and will bring a lot of confidence for the season to come. This entry was posted in News, sticky on December 14, 2015 by admin. The chairman has collected the EBFA registratio cards and will arrange times to distribute them before next weekend. Teams will be required to use cards from next weekend (21-Nov-15) and the paper roster sheets will no longer be accepted. Managers please make sure your team's subs are up to date so that the club can hand the cards to each team member. This entry was posted in News, sticky on November 14, 2015 by admin.